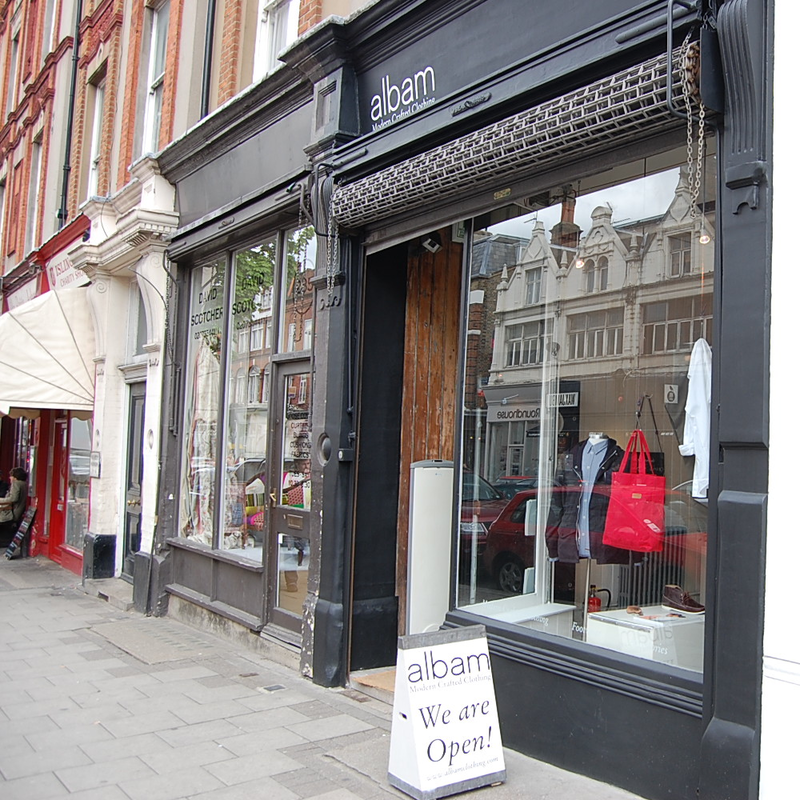 Albam set up shop on Upper Street. This rail and window display will ultimately pull me inside every time I'm in the area. The fruit of the Albam x Quoddy collaboration is particularly inviting. The guys consistently create well made staples that can effortlessly slot in to and ultimately add something fresh to any wardrobe. 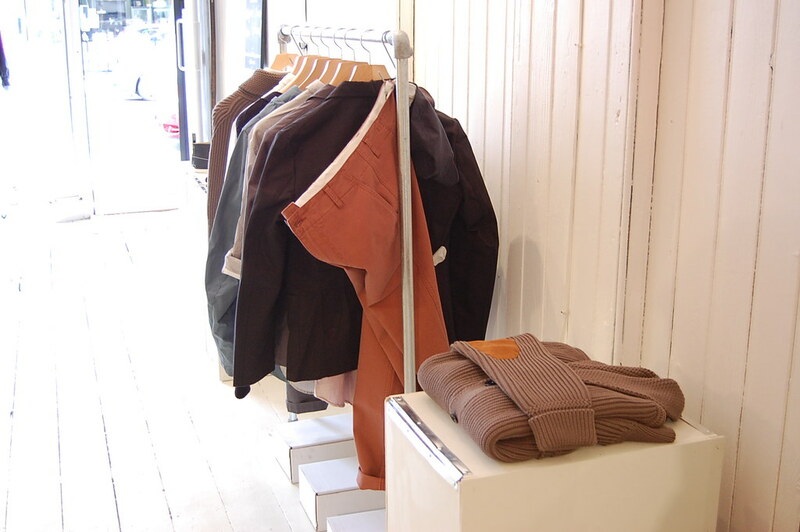 These are a selection of items that provide solid foundations for any stylish wardrobe to built around. With the ever present danger of a May downpour the outerwear is a good option. 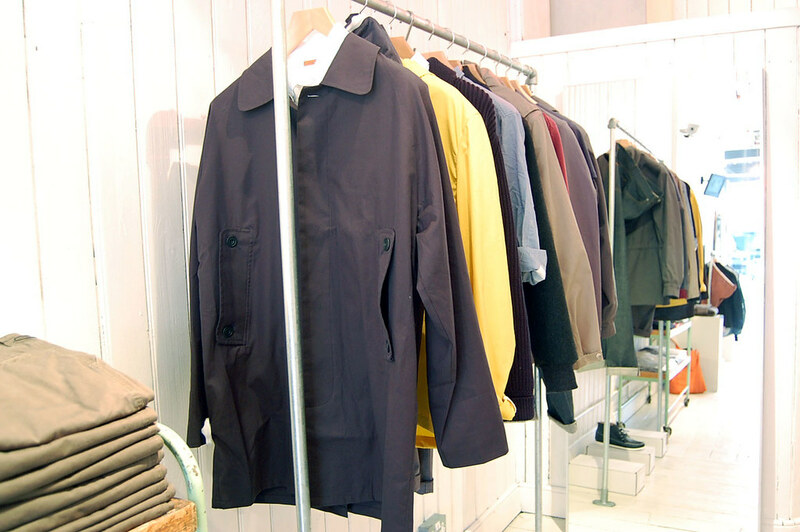 The Parka Rain Mac (front) is inspired by a famous shot of Steve McQueen. The raglan sleeve mac is looser fit, crafted in England from Teflon finished cotton canvas to help ensure you stay dry. 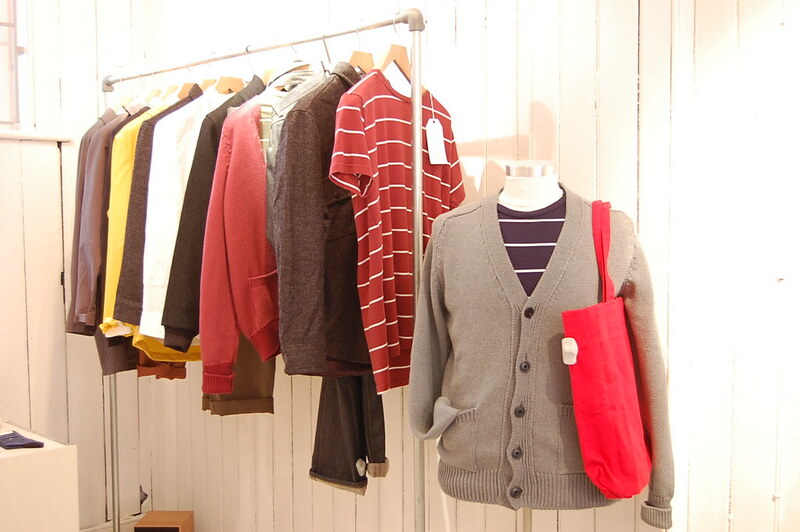 A grey elbow patch cardi sits in front of a carefully selected rail just in front of the initial rail. 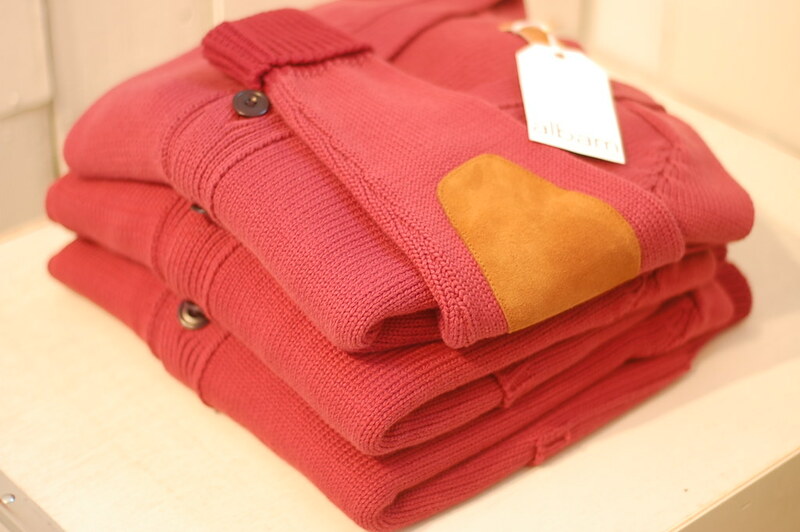 The elbow patch cardi.A simple cardigan knit, crafted from the finest Giza cotton. Details include tan suede elbow patches and an internal melton patch pocket. It is a simple and versatile piece, ideal for layering. These colourful shopper bags help cut down on plastic bag use in some style. 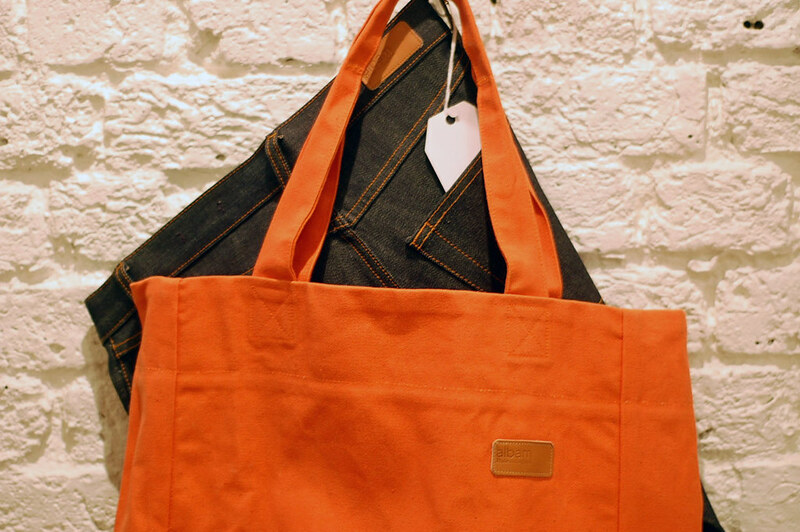 Made in England from 100% cotton canvas. 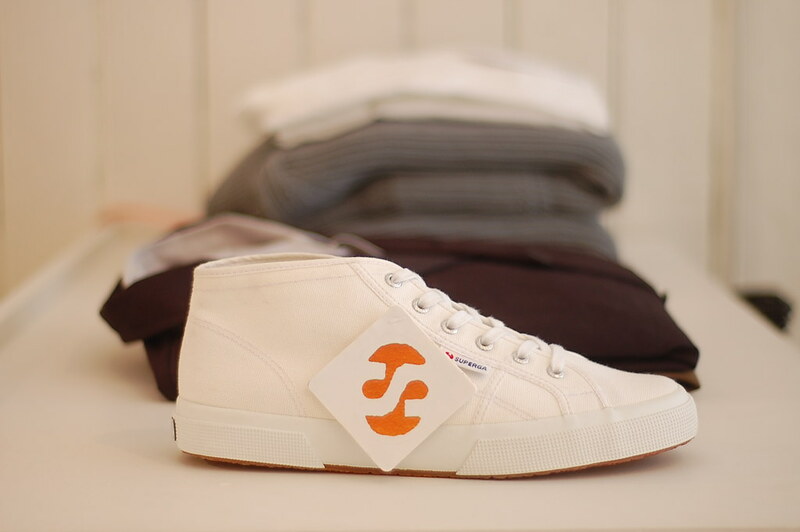 Albam x Superga - The Italian classic vulcanised canvas pump is ideal for Summer. The attractive view of the basement level. 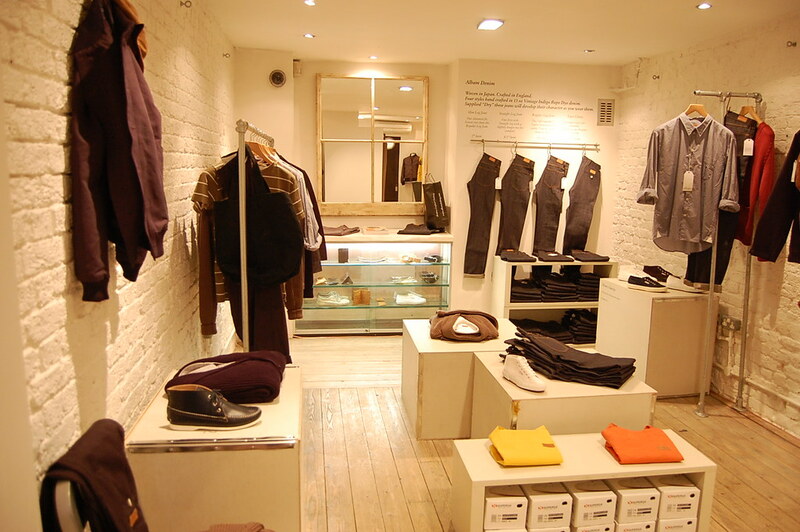 Denim, footwear, knitwear and shirting are all very tempting. 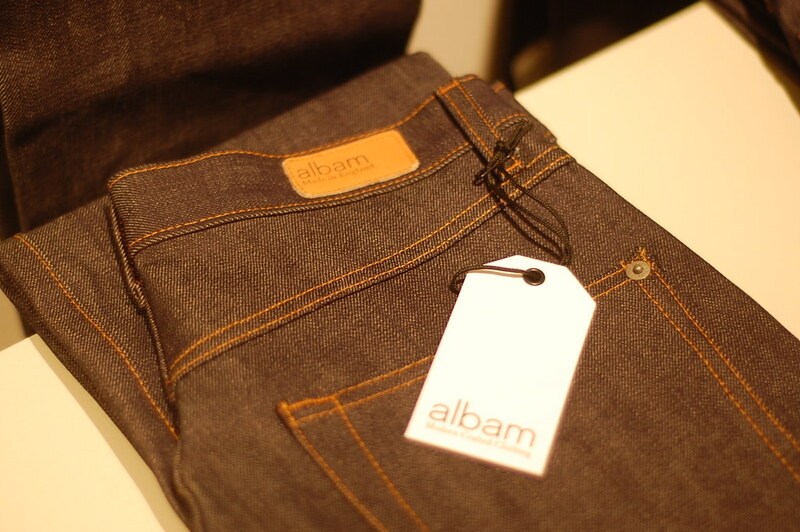 Albam's ever popular denim is woven in Japan but crafted in England. Supplied dry they develop a character all of their own as they are worn. 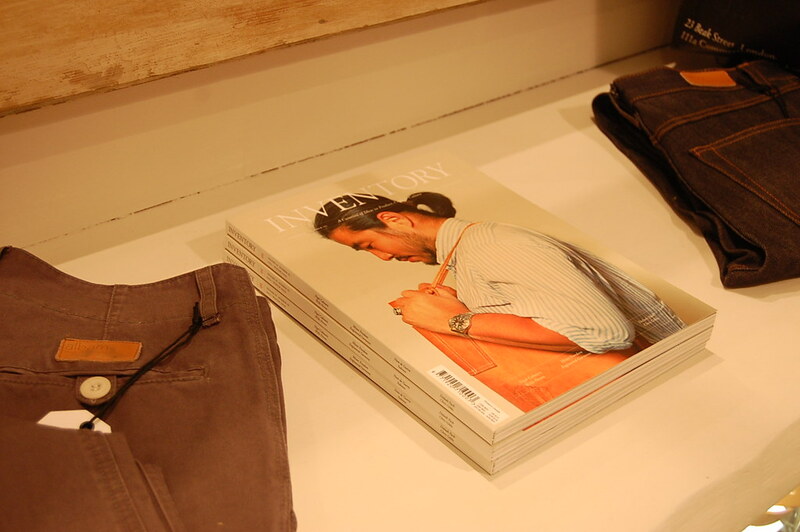 The first issue of Inventory looks at home sandwiched between chinos and denim. 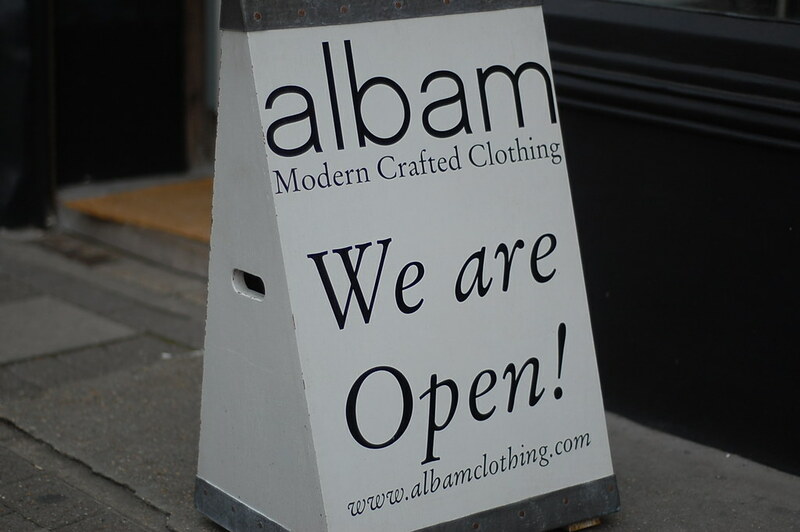 The guys are working on a book and exhibition which will document the craft and craftsmen that help make up Albam. 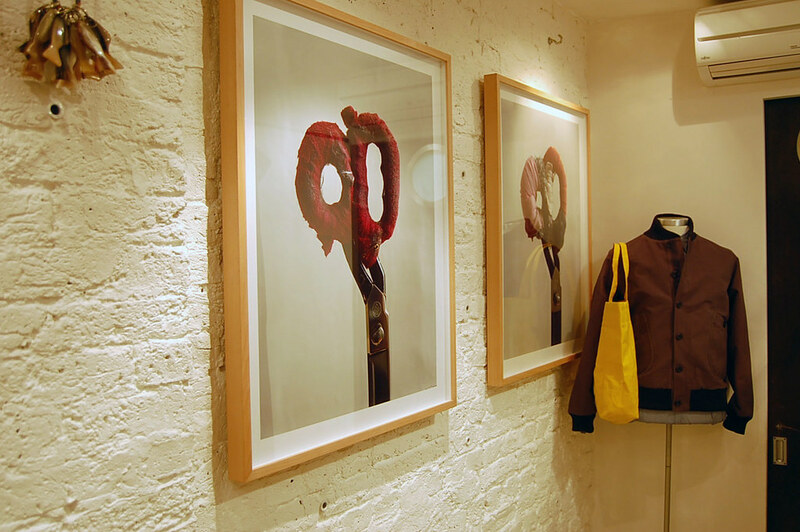 To whet our appetite two framed images sit hand on the downstairs wall. I have my eye on this shopping bag to inject a bit of Summer cheer and I think it is about time I tried on a pair of jeans. The third store is officially open. 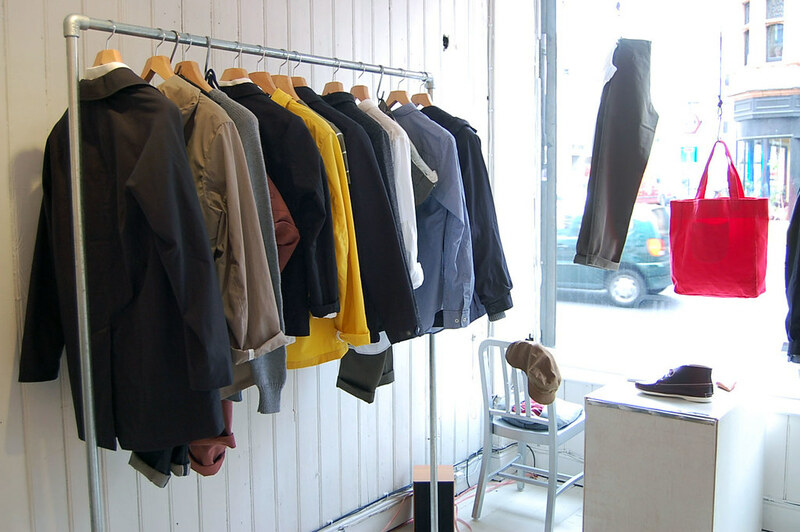 As it grows, Albam continues to manufacture their products in Great Britain and where possible and, when it is not, they look as close to home as possible for alternatives. They now have good friends in Portugal, USA and Italy adding to the craftsmanship which is a fundamental facet of the label. We love how the duo aim to bring as much product back to Britain and how they have spent the last couple of years building a business which is enabling their British factories to grow and develop along with them. With the chaps opening this store on Upper Street there is a danger that my Sunday afternoons might become that bit dearer. i can't believe it, this is round the corner from where i lived in london, it was a very nice street full of hidden treats. the shop looks great and they have a great knack of making everything they do, look perfectly simple and very nice on the eye. look forward to visiting in the future. ps get the orange bag! Nice little review that! It's changed loads since I was in there when it opened, it looks like a proper little shop now. They seem to be getting closer to wear I live though and I'm not sure I can cope with that level of temptation, plus those raspberry chinos have got my name on them! Now we just need Diverse Mens to move into a bigger space! Ohh, I miss Islington so much, I want a trip to Euphorium right now! Mat: Ha, well you'll just have to visit next time you make it to the big smoke. Right, I'll get the bag. Peer pressure! Lineage of Influence: Thanks! The guys always like to give it a few weeks whenever they open a new store before they fully announce it. They like to test the waters and ensure the space is 'Albamafied' in just the right way and they've certainly done that here. Clare: I am fond of Islington, so lucky to have it on my doorstep. Ok, next time I venture out I'll pick up the bag. great content. thanks for taking the time to write it. Shame I missed you at the party. Thanks for coming and visiting me at the Spitalfields shop though! 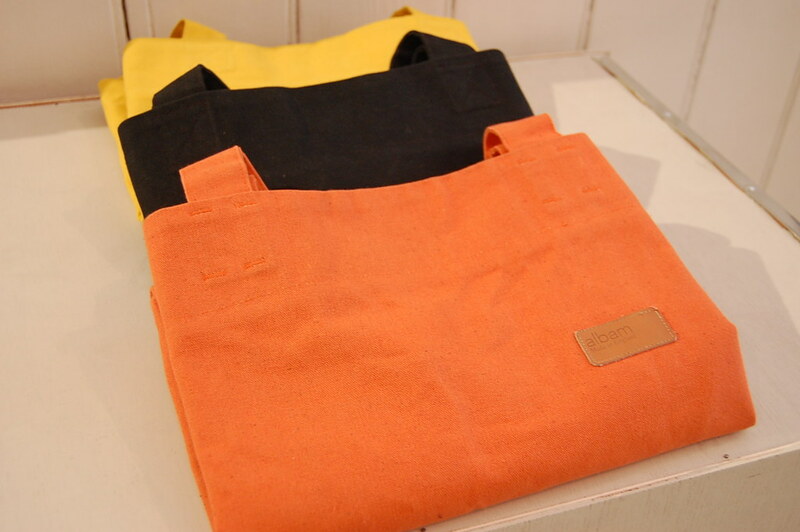 I'll be happy to sell you an orange tote though!